Today we are celebrating Joy's tenth birthday. Wondering what birthday parties are like in heaven. Pondering what life would be like if she was still here with us. Thankful for her story, her legacy, and how her short life transformed us in so many ways. Happy Birthday to our beautiful firstborn! 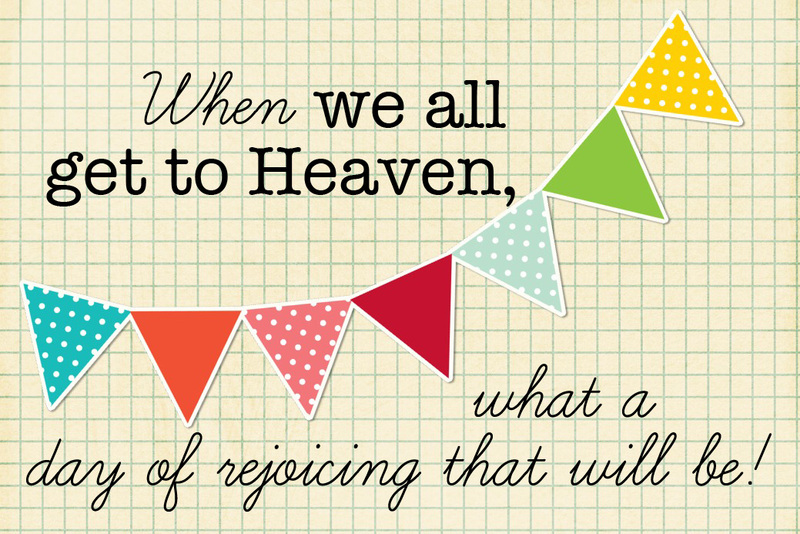 What a day of rejoicing it will be indeed! Excited that we will get to spend eternity with your Joy. I so appreciate your willingness to share your story and journey with all of us. your blog has been an inspiration to me for all the time I've been reading it! But...when I saw the "Ten" heading, I thought perhaps your little guy had slept that long last night? No? I never know the right thing to say so I will say happy birthday Joy! I LOVE this graphic. Happy Birthday Joy. What a beautiful day it will be indeed when we all get to Heaven! blessings to you and your family today. you all are so inspiring! Thinking of you and your fam today! Happy 10th Birthday to your Baby Girl! Praying for you and your family today! Your words and your grace touch my life. Happy Birthday to sweet Joy. May God celebrate with her in such a beautiful way today. What a sweet hope to know that you will be reunited. "brothers, we do not want you to be ignorant about those who fall asleep, or to grieve like the rest of men, who have no hope. After that, we who are still alive and are left will be caught up together with them in the clouds to meet the Lord in the air. And so we will be with the Lord forever. Therefore encourage each other with these words." I know that sweet Little one is rejoicing something grand up there with our savior. I am praying for you guys today I hope that you are coveted in peace. so very thankful you emailed me all those years ago to let me know about angie smiths blog... bring the rain. your openess and friendship was the first real friendship i made through blogs. your love for jesus shines like the stars! thank you for sharing joy's story. i will be rejoicing one day (as will many moms and dads) with their little ones that were 'taken' too soon. Happy Birthday Joy,what a party that will be! THinking of you and your family today as you remember and celebrate Joy. Prayers and blessings sent to you! Im saying a prayer for your family right now Julie. Hugs from New York. and praying His peace over you. Happy birthday to your angel girl! I can only imagine the hugs she'll be getting someday! Thinking of your family and want you to know what a blessing your blog has been in my life. God bless! I bet the parties up there are amazing! Happy birthday Joy!! Joyous Birthday! Today at Walmart, I asked the cashier how she was. She told me she wasn't great. I felt led to ask her if it was physical or emotional. She said it was emotional and that her grandson had died over the weekend. I asked how old he was, and she said, "Two hours." His name is Kevin. His dad's name is Sean, and her name is Twila. I told her my family would be praying for her. Such raw, fresh grief and so little I felt I could offer while paying for my groceries! I can only pray that in 10 years they will have a story of joy and hope to share. Thanks for sharing your story! Happy Birthday Joy! I imagine all of our babies in Heaven are celebrating together today! I'm sure my Madelynn is right along with her. Thank you for sharing her with us all! i wish it was in person. I'm a new follower and read your story lastnight- and my heart broke for you and your husband- but it also smiled. Seeing how you guys continued to leaned on God through the worst event in your life. Thanks for opening up and sharing your story- you are an inspiration! I am so glad to have found our blog! Happy Born Day to you Joy. I know you will wearing the birthday hat today and sitting at the table with our Savior. What a special birthday it will be to share it with the Lord. Happy Birthday to Joy! I'm sure her heavenly party is way cool. (((HUGS))) to you! Dancing around the throne of God, being in His presence 24/7, joining the angels in chorus to Him who is worthy...I cannot imagine a better way to celebrate being 10. Joy's story still brings tears to my eyes no matter how much time passes. She is a testimony to God's ability to redeem a loss and continue to bring joy to your family in other ways. thinking of you and your precious gift today. "When we all see Jesus, we'll sing & shout the victory!" Thinking of you and your incredible family today, Julie. Happy Birthday to your little one! I can't imagine the emotions you are experiencing today. Happy birthday Joy! I never was truly thankful for the gift of eternal life in heaven until I became a mother. Thank you Jesus! Oh, I imagine a big, huge part of all parties. I've been following you blog for a few months now, and I so wish we lived in the same town as I believe we would be good friends :) This is the first time I have read your story about Joy, and i cried with you. I know the loss of miscarriage, and could not imagine loosing a baby. You are a beautiful woman and i pray blessings over your lovely family. happy birthday Joy..and many blessings to you and your family. Grateful for your vulnerability. It's going to be one blessed birthday celebration! Beautiful post. Happy birthday, Joy! Love Gungor's song, "This is not the end:"
sending beautiful love to you today. I am sure she is having a wonderful party1 Happy Birthday Joy! Thank you for your transparency and vulnerability. I've been following your blog for awhile and just read through Joy's story...TEARS. Your hope and uplifting words were exactly what I needed today. Joy is the perfect name...emotion...state of mind. You are such a strong women. I can't begin to tell you how inspiring you are.